How others treat us is directly related to how we value ourselves. Women most especially often have low expectations. This is most evident the wage gap and the low pay in professions that are predominately women such as teachers, nursing etc. Most of us have probably heard the saying (I’ve used it here), “You get what you expect.” Today’s message addresses that but takes it farther. Too often, we don’t expect enough. 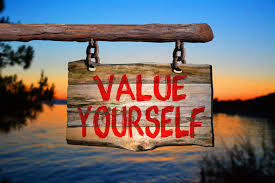 We don’t value ourselves enough. We don’t feel and honor our own self-worth. We value others over our own. Seeing others as more valuable or deserving than ourselves is an illusion created by egos and perpetuated by the media. Because our authentic self does not see judgment, it knows that everyone valued the same. Every one is as deserving as the next person. Everyone’s life purpose is as valuable as anyone else’s. When we don’t realize this, we self-sabotage because we expect too little. And guess what? That is exactly what the Universe delivers. We are asked today to live to our full potential. Act important because you are. Act deserving because you are. -A funny video from Jame and Alex’s vacation in Thailand of Monkey Island. -Ahhhh we are thawing out. Warm temps promised an early Spring or at least that is what the groundhog said. -Spending the night with my Mac and AJ. -Catching up on a Netflix series I have not seen since last year.